Thursday night I drove up to Big Rapids Community Library to hear two men speak. I had not heard of either of them until last week. While on our way home from Branson, I began reading Deadly Voyage. It is an account of the wreck of the Daniel J. Morrel in Lake Huron in 1966. Once I had read the first chapter, I told Tom, "You are going to want to hear this." And so for the rest of the day, I read the book aloud. There were times I had to stop because of tears and we had to take a break to talk about the events before I could go on and finish. But what a story. I emailed the author, Dr. Andrew Kantar, to tell him what an excellent book he had written. He answered me and told me that Thursday he would be speaking in Big Rapids along with the only survivor of the wreck, Dennis Hale. Andrew Kantar answering questions from the audience. Dennis Hale with the life jacket he was wearing when he was rescued by the US Coast Guard. Sunday morning we left our home away from home in Branson but we actually pulled it behind us. Our trip home went well. I finally decided to learn to drive the truck and 5th wheel. Actually, we saw so many 'old' women driving even bigger rigs, that I thought it was time I learned. It was not difficult to drive but I only did expressway miles and not on small, twisty town streets like Tom had to. We stopped for the night in Kankakee, Illinois. We had a campground directory with us so when we decided we wanted to stop for the night, I found a campground nearby and gave them a call. So they were all set for us when we pulled in. It was a quiet place so we had a restful night and headed out after breakfast in the morning. 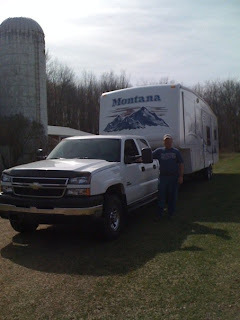 We arrived home around 1 in the afternoon, unloaded the 5th wheel and got back to the condo around 2. I thought I had better post some pictures of our campground. We found it on the internet and we have been very happy with our accommodations. The people who work here are very helpful with all the problems we've had along the way. This is our 'rig' with the truck and 5th wheel. The campground is very quiet and most of the other campers are older than us and returning from spending the winter somewhere south. This is a shot of the laundry building taken from our site. It was clean and convenient. America's Best Campground was just getting flowers planted and ready for spring. They had a rough winter here and even had some snow. Yesterday we attended a show called Cassandre-Voice of an Angel. Cassandre has been singing in this area for years and really has an incredible voice. She was backed up by an orchestra that was really lovely. As with each show here, there was a tribute to veterans and a gospel song. In fact, Cassandre gave a great statement of her faith. We have had a share of problems getting into the RV lifestyle. One thing that surprises me is the number of people who are touring the country and living in RVs. We met many people on the trip out here and then every day we have met more RVers. Its fun to hear their stories about where they have been. Lots are on their way home from Arizona. Our 5th wheel has presented us with challenges as we learn 'the ropes'. One such incident happened yesterday. On Wednesday our kitchen drained stopped working. It stopped abruptly. Didn't slow down gradually-just quit completely and wouldn't even drain slowly. We wracked our brains for answers but couldn't come up with a solution. It didn't act like there was a clog but that was the only thing we could think it might be. So yesterday, when praying for our day, we asked for help with the drain. After breakfast, we headed out for Wal-Mart and got a plunger and a clog dissolver. Today was beautiful and Tom got our bikes all set up so we set out exploring. Near the campground, there is a business park with wonderful roads-but there is nothing there and the roads aren't open. The downturn in the economy is hitting Branson hard too. A waitress was telling us how tough it has been-not nearly as many visitors as normal. Anyway, these roads were great for bike riding except that everything here involves hills. But it made for a great time of exercise and fun. We have had a fun day and I've uploaded lots of pictures so I hope you aren't bored with them. But we started our day with a 10 AM show which was recommended to us by the people at our campground-ABC which stands for American's Best Campground. That's a story in itself because as we were driving here, I looked them up on my iPhone and found their address which I entered into our GPS. But by mistake, I had clicked on ABC Dolls and we ended up there. We were glad it wasn't our campground because it was right on the 'Strip' here in Branson but it made quite an adventure to get turned around there and then find our campground. We spent yesterday morning attending the show we had won the tickets for. It was Ricky Boen and the Texas Mud. They are a Texas swing band, an old-fashioned kind of country and western music. While they were all good musicians, I'm not wild about that kind of music. There was lots in the show that kept it interesting though.The female singer also served as Ida Clare, the comedian, and she was truly funny. All the entertainment here so far has been very family friendly. Ida Clare kept us laughing with jokes for the whole family. Yesterday we drove around St. Louis and saw the Gateway Arch and the Mississippi River. Both impressive sights. The Mississippi River with a barge and tug. See the Gateway Arch off in the distance. When gassing up our truck, we have to go where the big boys go. We read all the information we could find but we weren't prepared for some things-like where do you gas up the rig. Our outfit is too big to just pull into regular gas pumps so it took us several tries to get a system that works. Here's what we've come up with. If you can give us some hints, we'd love to hear from you. When we first pull into a gas station or travel center, I get out and walk around and then return and tell Tom where to head. It beats driving around and trying to turn the big rig around with semis driving all over. This picture shows what we have to deal with when gassing up. Last November when we bought our 5th wheel, we knew it would be a long time before we got to use it. Yesterday was that long-awaited day. After days of preparation-mostly on Tom's part- we pulled out the driveway and hit the road. But there were a few glitches in our plan. The end of the story is we stayed in Holiday Inn Express last night and we'll start the RVing life today-hopefully. To start with. I bought new bedding and opened it and was making up the bed before we left when I realized I had gotten the wrong size mattress pad. I know I had a queen size in my hand but I must have set it down and picked up a full-size. That wasn't a big obstacle but it was irritating. Then I found I had forgotten pillowcases. Both of these could be corrected with a quick stop at Kohl's but we never did find one.